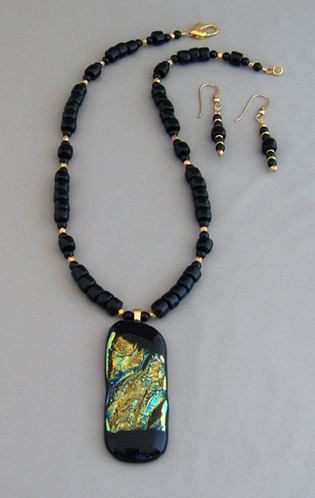 This set features a transparent black, handmade fused-glass pendant with predominantly gold dichroic glass. 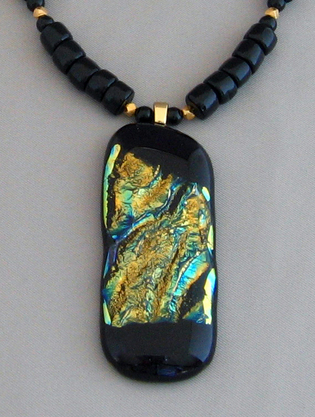 It is strung with polished black coral, onyx, and 14kt gold fill beads. The pendant bail is 14kt gold plate and the clasp and earrings are 14kt gold fill. Pendant is approximately 2-1/8" long.